Three high school students from Okinawa, Japan who had won the third annual competition, Science in Okinawa: Research for Enterprise (SCORE! ), visited San Francisco and Silicon Valley, California from February 20 to March 2, 2015 on the 2015 TOMODACHI-SCORE Study Tour. During the study tour, the students visited leading research institutions, discussed their research project with researchers, and had opportunities to present their research to the students at a local high school. In the beginning of the program, the students visited the California Academy of Sciences, Muir Woods National Museum and UC Botanical Garden at Berkeley, California. The students were thrilled that they were able to study the ecological systems they encountered at these locations since their interests are in photosynthetic bacteria as well as botany. In addition, they were able to engage in passionate discussions about plants, birds and insects with the professors and experts at these institutions. The students also visited UC Berkeley and UC Davis and participated in campus tours, as well as a company visit at the Renewable Energy Group, Inc. San Francisco branch office. As one of North America’s leading biofuels producer, Renewable Energy Group, Inc. has nine biodiesel refineries across the country. While on the company visit, the students fully utilized their English skills to ask numerous questions to the company researchers who were from various different countries such as Brazil, Korea and China. In addition to visiting universities, the students visited Lowell High School, where former Ambassador to Japan, Ambassador John Roos had graduated. 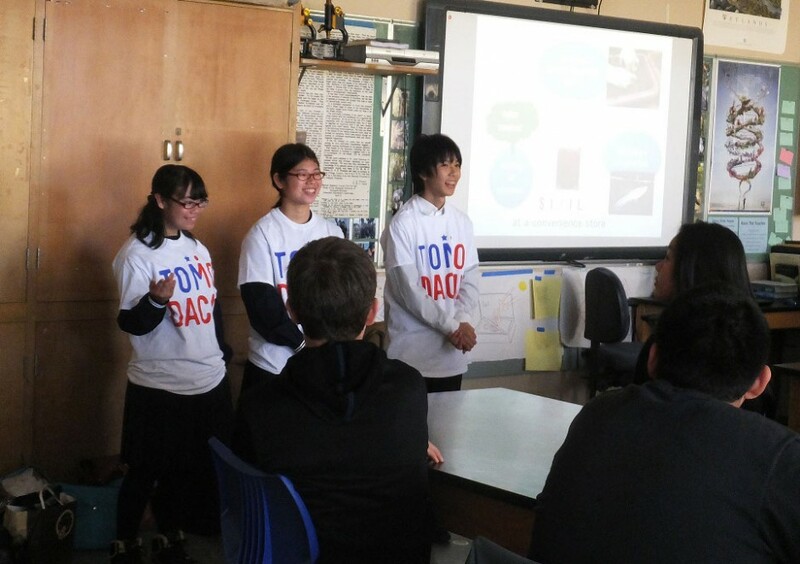 At the school, the students presented their research findings in an AP Biology class and a Japanese language class. Following their presentation, they met with Kaz Maniwa, Senior Vice President of US-Japan Council, and discussed the goals of the TOMODACHI Initiative and the importance of fostering the next generation of young leaders. Toward the end of their trip, the students visited the SLAC National Accelerator Laboratory, saw bio-related incubation centers, and toured Stanford University’s main campus. The students were able to meet and talk to various scientists and entrepreneurs who are currently working in the field of biology. The students’ days were filled with various inspirational activities, deepening their knowledge about science and the role science plays in communities and people’s daily lives. On top of all of the educational activities, the students also had time to sightsee the Bay Area, visiting museums and aquariums. One of the participants, Ibuki Uema stated, “We have been thinking about the topic of business from the perspective of selling photosynthetic bacteria in convenience stores. We had been told that our business idea would be hard to realize in Japan, but when we presented our idea in Silicon Valley, people’s opinion toward its success varied greatly. Through this trip, I learned that our will and determination to start this business is far more important than the difficulties and challenges we would face in realizing this dream. I am determined to use the experiences I have gained and the lessons I have learned from this trip in Japan to start this business of ours”.